No rest for the wicked so they say… I just can’t seem to remember what I have done wrong!! No sooner had the stress of getting the cakes finished and delivered on time died down than my daughter’s request for help in sorting out movie inspired fancy dress costumes for herself and her partner was repeated!! This was Tuesday and the fancy dress party is today – Saturday! I had been given an inkling that I would be involved in this a few days before but there was nothing I could do until the cakes were out of the way. 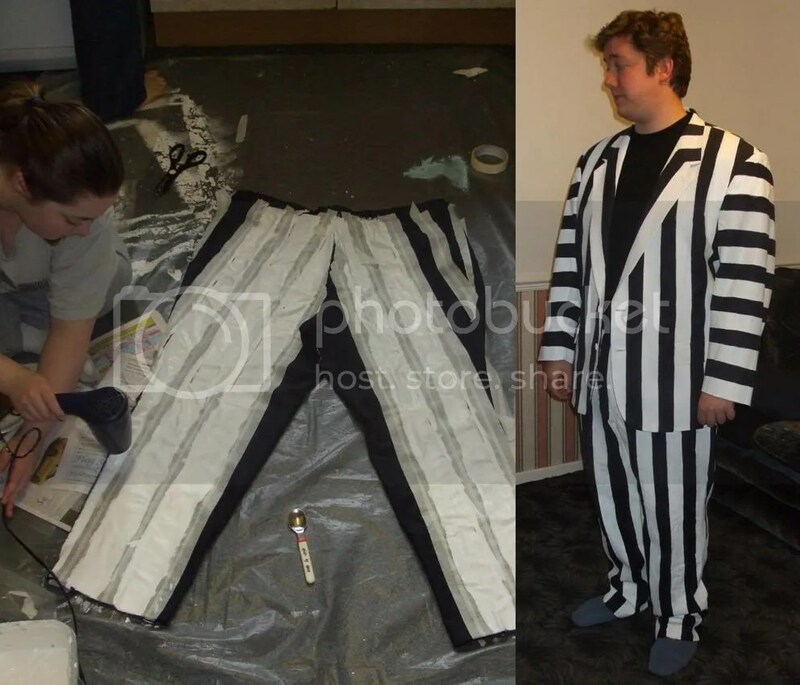 I had had time to think though…and persuade my husband that the ‘tatty old’ pin stripe suit in his wardrobe was past its best and begging for a make over! So at the crack of dawn on Wednesday morning I was hard at work applying masking tape to this suit! It does worry me a bit though, that when my son passed through on his way to work he didn’t so much as raise an eyebrow at the vision of his mother applying masking tape to his father’s suit and burnishing it with a spoon! Although I had to go out on Wednesday, my daughter did her bit and tackled the painting job. Stressing over the stripes has taken so long though that I have only been left with a day to create the costume for my daughter – who has decided to dress as a Geisha. 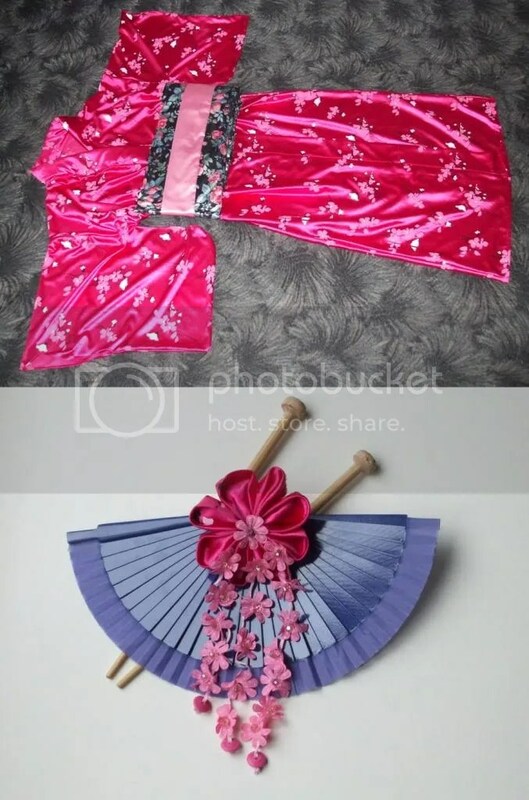 The internet is a great resource for all manner of things and I have managed to find out all about the costumes and way of life of a Geisha, and found a pattern for a kimono and detailed instructions on how to put up long hair with chopsticks and make beautiful fabric tsumami kanzashi flowers for the hair decoration. Pieces of fabric from my ‘deep and extensive’ materials stock have been put together to make up the kimono and omi and I have ‘remastered’ a couple of shop bought hair bands in order to get the little flowers for the hair decoration. Cut down Chinese take-away chopsticks with corks added for safety reasons (!) 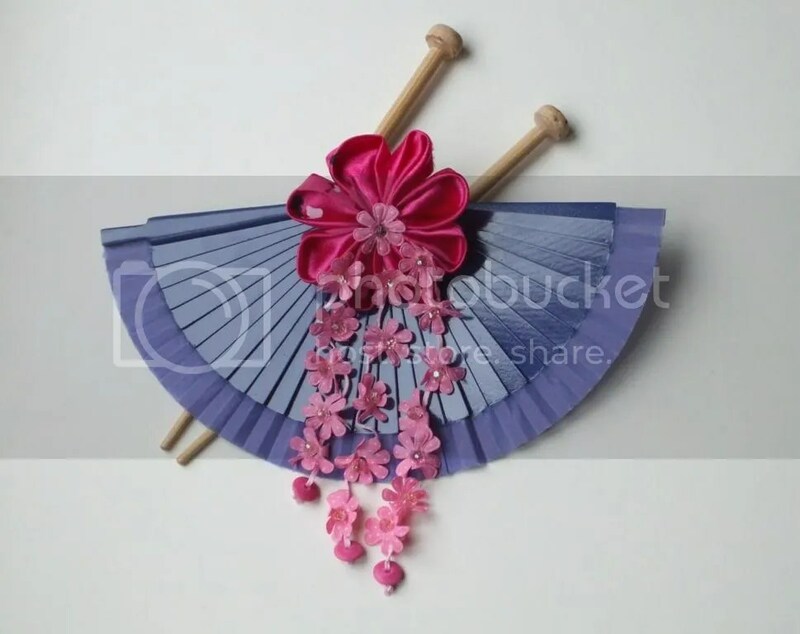 finish off the ensemble – along with a fan that I have had for ages. My daughter hasn’t seen any of her finished costume yet so I hope she is happy with it… I might get to see both her and her partner ‘in full costume’ later on today! Whether I will be able to get a photo of them both is a different matter!